Scientists at DanStem, the Danish Stem Cell Centre, University of Copenhagen have identified one mechanism that explains how some stem cells choose to become a given cell type: the cells combine specific sets of proteins at precise positions along the DNA. When these particular groups of proteins are combined, the gates are opened so that certain groups of genes can now be used, driving the cells towards a new identity. Scientists have now identified one of these combinations, which drive the cells along the path that allow them to become organs such as liver and pancreas. 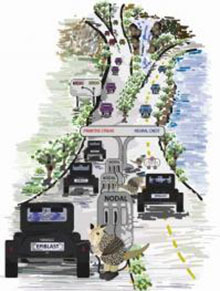 The cartoon on the left shows this, only the cells (cars) which receive the NODAL fuel are allowed to pass onto the 'primitive streak' road - this is the route which allows them to become organs, such as the pancreas. This latest research could lead scientists to a better understanding on how to generate insulin-producing cells in the laboratory to use as therapy for Type I diabetes. Scientists working under the leadership of Henrik Semb from the DanStem Center at the University of Copenhagen have explained how the acquisition of a new cell identity is achieved; cells respond to information from their surroundings, in turn activating a specific combination of proteins at certain places on the DNA, to turn on a genetic programme. “We added one particular chemical compound to the culture media to promote the generation of new cell types. The information transmitted by this compound is deciphered only by a small number of proteins. We then looked all along the cell’s DNA to find the positions of the proteins that were activated by the compound. We repeated the experiment using additional compounds, to get an idea of how specific the responses were and to categorize the genes that the cells decided to use when being directed toward different cellular fates,” says Assistant Professor Karen Schachter. The work in the field of human pluripotent stem cell research has concentrated on finding the correct combination of drugs or chemical compounds that can be used to drive the cells into specific cell types in the culture dish. “There is however a lack of understanding of how these compounds activate the genes that give the cells unique identities, which has resulted in a lack of reproducibility of the methods used by different labs. As a comparison; if you use a pre-mixed powder to bake a cake you will face problems if you run out on an important ingredient and do not know how to replace its action. We believe that our study provides useful information that will help us to understand the recipe better, so that we can generate functional cells in a more controlled manner,” adds Post doctoral researcher, Nina Funa. There is already a lot of focus in the stem cell community to generate cells in the laboratory to use as therapy, so the scientists at DanStem want to emphasize the importance of continuing doing this important basic research work. “Our ultimate aim is to understand how stem cells make choices, which will also help improve the quality of the work that will put stem cells into therapeutic use,” concludes Funa. This image shows human embryonic stem cells stained with blue (DAPI). The panels on the left show that only cells which express a regulator of transcription OCT4 (pink, middle panel) continue on to becoming part of the primitive streak (as evidenced by the presence of BRACHYURY, shown in yellow left panel). This piece was reproduced by kind permission from DanStem (Danish Stem Cell Centre, University of Copenhagen). It was first published on their website.